I’ve just started to read Bruce Waller’s new book Against Moral Responsibility. As might be guessed from the title, the book is rejection of moral responsibility, written explicitly from a naturalistic viewpoint. Since I’ve only just started it, I can’t comment meaningfully on its overall success. I can say that I’ve enjoyed what I’ve read so far, although its slightly less formal in its style than I would have liked. I want to try to correct that problem in this post. I do so by examining the basic argument that Waller offers in his first chapter. His basic argument (not to be confused with Galen Strawson’s Basic Argument which I’ll be talking about in a minute) focuses on the fairness of blame and reward, but he presents it in a two different ways: the first way by developing his own thought experiment, and the second way by jumping into a pre-existing debate between Galen Strawson and Alfred Mele. Although the first way is probably the simplest, I’m going to focus on the second way here. I do so largely because it allows me to cover some interesting arguments by leading figures in the field of moral responsibility. In the remainder of this post, I will focus directly on the dialectic between Strawson and Mele. This requires first looking at Strawson’s Basic Argument against moral responsibility and then looking a Mele’s reply. In the next post, I’ll look at Waller’s contribution to the debate. Strawson’s basic argument against moral responsibility turns out not to be so basic. At least, not if basic means “simple” and “straightforward”. The problem is that there are several different versions of the basic argument floating around in the philosophical ether. Indeed, I have read one article in which Strawson outlines four different versions of the argument (it’s in the Oxford Handbook of Free Will, in case you’re interested). I’ve come across at least two other versions presented by Strawson in other articles, and Waller himself presents an abbreviated version in his book. This brings the total number of versions to at least seven (by my count). I’m going to limit myself to two versions of it here: (i) the regress version and (ii) the causa sui version. The causa sui version of the argument really is quite simple and straightforward. It’s also the version I like the most, partly because it exposes a problem I have with the regress version. Given this, one might think it best to skip the regress version altogether, but we have to look at the regress version since it’s the one discussed by Mele and Waller. So I may as well explain my problem with it as I go along. If you take the time out to compare this summary with the cumbersome version of the argument linked to above, I think you’ll find it to be quite fair, if highly compressed. In any event, one can see the attempt at a regress even in this compressed presentation: we start with a principle about responsibility for particular acts, we link responsibility for particular acts to one’s agency properties (character, mental states etc.) at the time of those acts, and we then link one’s responsibility for those agency properties to choices made at an earlier time. This need to link responsibility at one moment in time to responsibility at an earlier moment in time is recursive, i.e. it keeps needing to be re-inserted into the argument. Hence we get a regress. (1) If one is to be responsible for how one acts at time Tn, one must be responsible for how one is at Tn. (2) To be responsible for how one is at Tn, one must have chosen to be the way one is Tn. (3) Therefore, in order to be responsible for how one acts at Tn, one must have chosen to be the way one is at Tn. (4) To be responsible for choosing to be the way one is Tn, one must be responsible for the principles of choice (preferences, values etc) that guide one’s agency-forming choices prior to Tn. (5) Therefore, in order to be responsible for how one acts at Tn, one must be responsible for one’s principles of choice prior to Tn (from 3 and 4). (6) To be responsible for one’s principles of choice prior to Tn, one must have chosen to have those principles of choice prior to Tn. (7) Therefore, to be responsible for how one acts at Tn, one must have chosen to have one’s principles of choice prior to Tn. Transfer Principle of Responsibility: An agent is responsible for causing an outcome, event or state of affairs at Tn, if and only if they were previously responsible for the outcomes, events and states of affairs that lead them to Tn. I call this the transfer principle because it says that responsibility for particular acts at one moment in time must be transferred from responsibility at an earlier moment in time. I think this principle is needed to make the regress argument compelling and I think its truth is, at the very least, open to doubt. Causa Sui Principle of Responsibility: An agent is responsible for their actions if and only if they are a causa sui (in a least some crucial mental respects). (9) No agent can be a causa sui (in crucial mental respects). (10) Therefore, no agent can be responsible for their actions. I trust you can see why I prefer this version of the argument: it’s simpler, more elegant and it makes clear the overarching principle of responsibility that is guiding the reasoning. That said, I’m not sure that this renders the regress argument a pointless distraction. On the contrary, something like the regress argument could be used to support the claim that no agent can be a causa sui (premise 9). Anyway, this has been a long, and perhaps unnecessary exegesis of Strawson’s Basic Argument. Still, I hope it’s been mildly interesting. For present purposes, all we need to focus on are the transfer and causa sui principles of responsibility because it is these principles that Mele seems to object to in his work. The Case of Betty: Betty is a six-year-old girl who is afraid of the basement in her house. She knows that no harm has come to anyone, including herself, who has entered the basement. But she is still afraid. Nevertheless, she recognises that her fear is “babyish” and takes steps to overcome come it. She starts to make periodic visits to the basement, staying slightly longer each time until she no longer feels afraid. After following this method for a few months, she loses her irrational fear. Second, the thought experiment pumps certain intuitions we have about responsibility. Mele acknowledges that Betty does not choose her original set of character traits — the traits that allowed her to self-modify — but he questions whether she needs to have done this in order to be a responsible agent. He thinks that, looking at the thought experiment closely, we will be inclined to view Betty’s self-modification as a responsible act (i.e. one for which she is responsible) and, furthermore, one which allows her to be responsible for future acts. He says we will think this unless we are presented with evidence suggesting she was brain-washed or coerced into the self-modification. The fact that she has not chosen to have the original set of character traits that allows her to do this will not enter into our considerations. 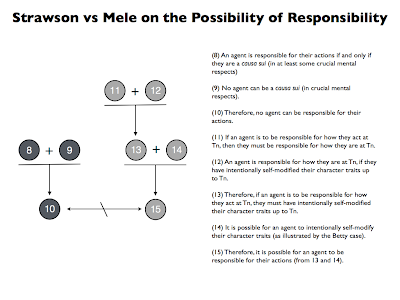 (11) If an agent is to be responsible for how they act at Tn, then they must be responsible for how they are at Tn (slight modification of (1), above). (12) An agent is responsible for how they are at Tn, if they have intentionally self-modified their character traits up to Tn. (13) Therefore, if an agent is to be responsible for how they act at Tn, they must have intentionally self-modified their character traits up to Tn. (14) It is possible for an agent to intentionally self-modify their character traits (as illustrated by the Betty case). 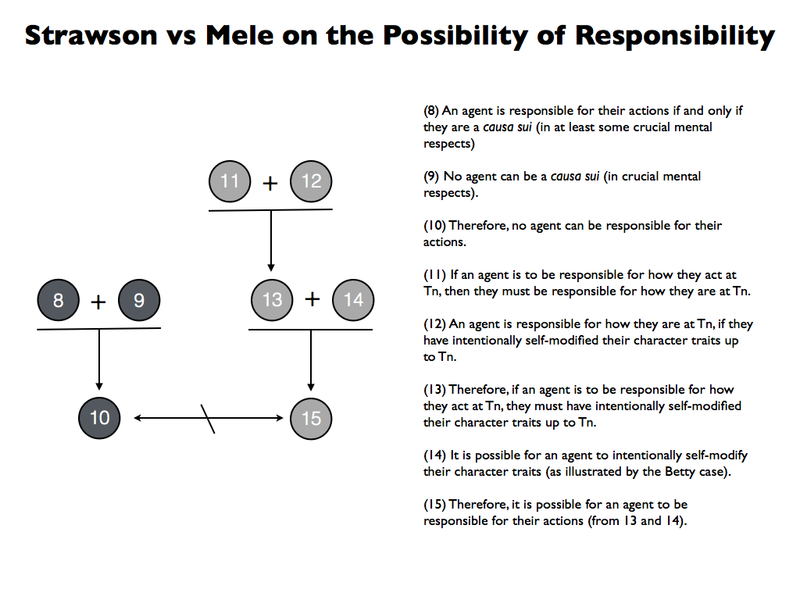 (15) Therefore, it is possible for an agent to be responsible for their actions (from 13 and 14). So there we have it, a direct objection to the causa sui version of Strawson’s argument. The dialectic between Mele and Strawson is illustrated in the argument map below. Which side wins this particular debate? Unfortunately, there’s no easy way to tell. Both have presented valid arguments for their side, but both of those arguments rest on principles of responsibility that are, at best, intuitively supported. The question then becomes which principle do you find more intuitively compelling. Obviously, based on his thought experiment, Mele thinks his principle is more compelling, but Strawson, no doubt, finds his more compelling. Is there any more satisfactory way to resolve the dispute? Unfortunately, no. Most disputes in moral philosophy end up like this: a clash between intuitively compelling principles. Still, there might be a way to resolve the dispute if we can find another principle that is more compelling than both Strawson’s and Mele’s, and that better explains our intuitions about judgments of moral responsibility. 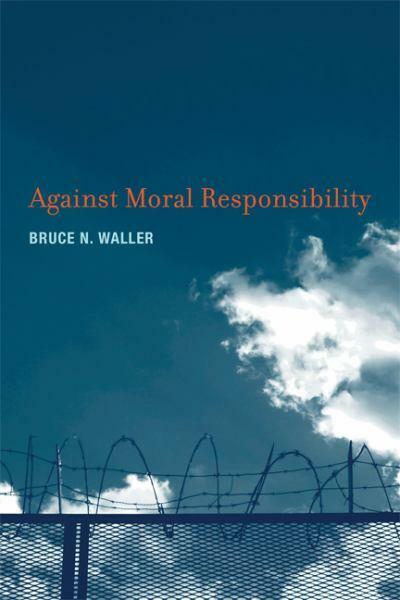 Essentially, this is what Waller tries to do when presenting his basic argument against moral responsibility. We’ll be talking about that in part two. "(1) If one is to be responsible for how one acts at time Tn, one must be responsible for how one is at Tn." For myself, I don't see why anyone should accept the first premise of Strawson's argument. I expect that the notion of responsibility as applied to humans is of a piece with the notion of causal responsibility as applied to inanimate objects, and as the latter are not responsible for their own nature, we shouldn't expect psychological self-determination to be requisite for humans to be responsible at the moment of action. I do think that someone like Betty is more responsible for her actions, however, due to her reflective decision to overcome her fear of the basement. So, although humans can be responsible merely as material beings, or as unthinking animals, they are most responsible when they exercise their rationality (then, to echo the argument above, they are "truly" responsible).